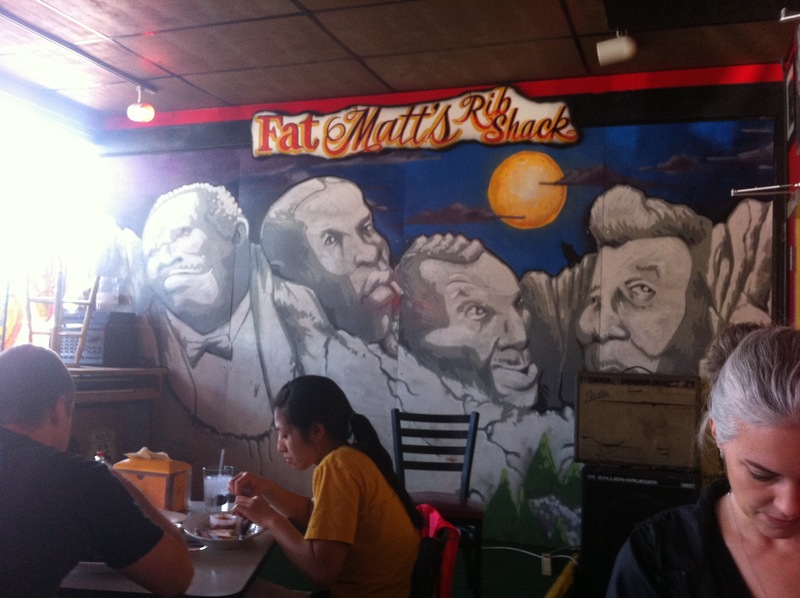 While on a visit to Atlanta, the word I heard (via my cousin Liz at first) was to try Fat Matt’s Rib Shack. Boy am I glad I took her advice, because they serve by far the best ribs I’ve ever had in my life, so far. First of all, a word about the atmosphere. The place itself is very much what it says in its title: more or less a shack. It is situated along the road with a small parking lot. There’s an outdoor seating area that accommodates perhaps 25(?) people and an internal dining area. The place is not fancy – not surprising – and excellent blues and roots music wafts through the air, along with the heavenly scent of ‘cue. At the back of the shack there’s a small stage and a mural based on Mt. Rushmore, with B.B. King, Robert Johnson, Chuck Berry and Muddy Waters replacing Washington, Jefferson, Roosevelt and Lincoln. Just through the doorway is the counter where you place your order, and on the wall you can see the menu. 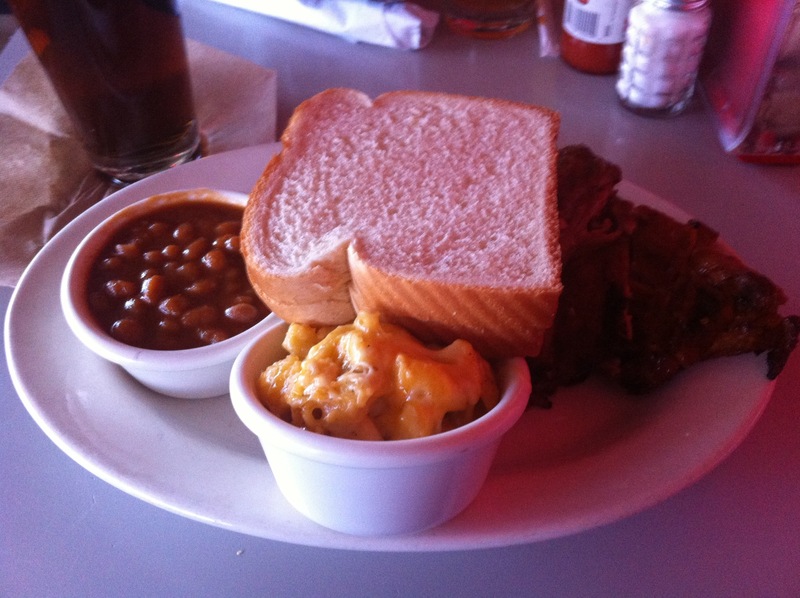 I went for the half rack, Mac, and beans while the missus took the chopped pork sandwich and collard greens. 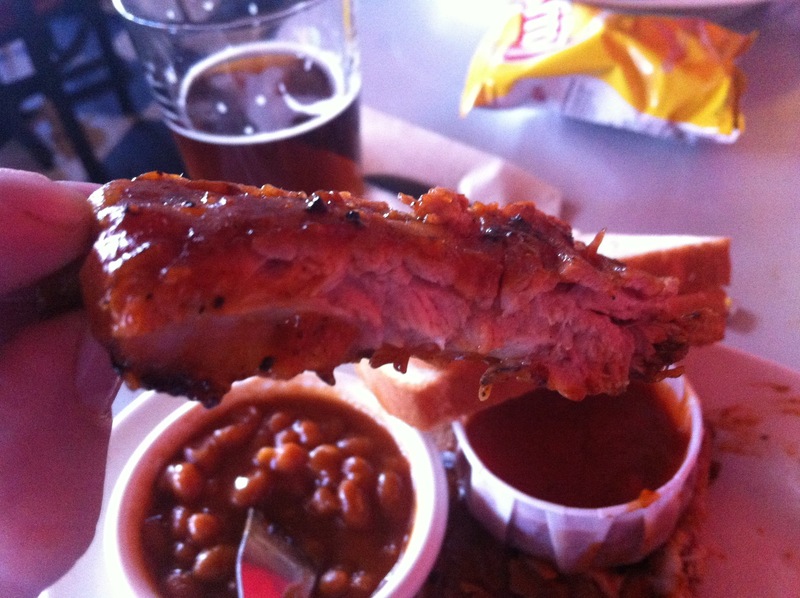 I picked the winner though, because the ribs were insanely delicious. 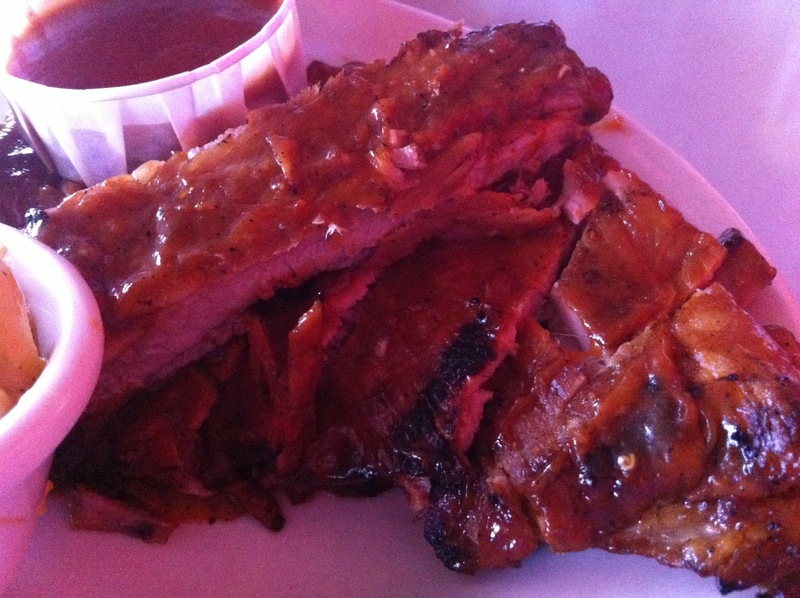 The meat on the ribs was tender, moist, juicy and succulent, with just a trace of bark. It was not fall off the bone – it nearly dripped off the bone. However there was still enough native tension so that it would not give until you bit into it, and then it would yield willingly. The meat tore off in mouthfuls, not stripping off the bone all at once. The flavor included a good level of smoke and was not too spicy. I thought they were amazing. Both the mac and cheese and the beans side dishes were tasty, to be sure, but their delight was dwarfed by the magnificence of the ribs. 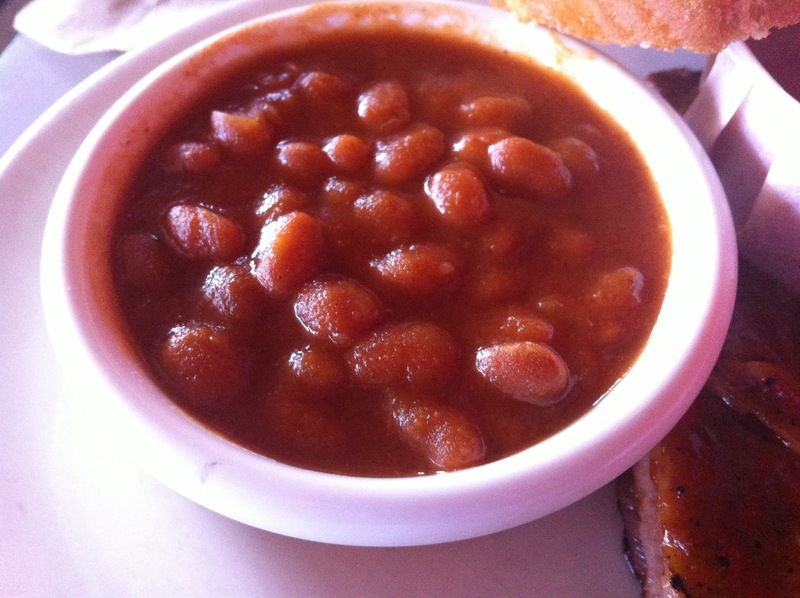 The beans were sweet and had a vinegary undercurrent. 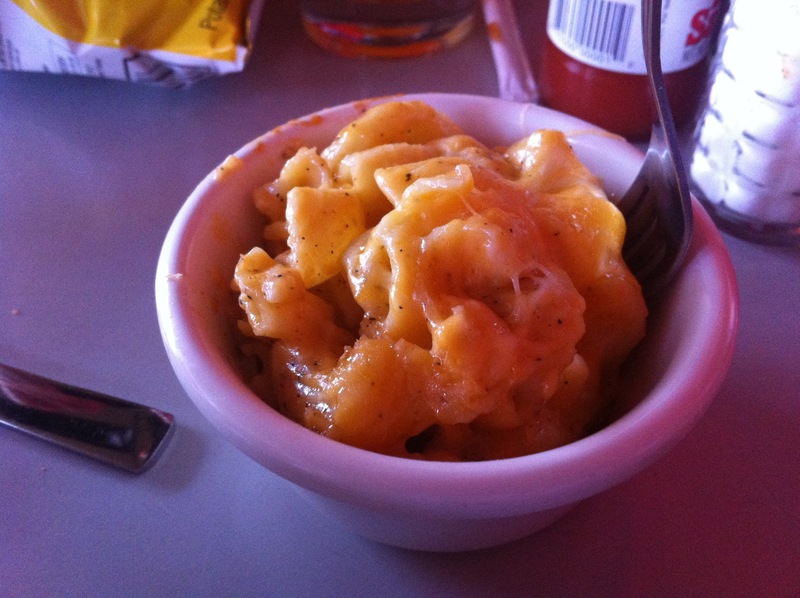 The whole dish is served with an additional portion of the sauce on the side. Frankly the ribs didn’t need additional sauce in my opinion. They were moist and juicy enough, and the sauce just brought an additional sweet, along with the aforementioned presence of the vinegary undercurrent. 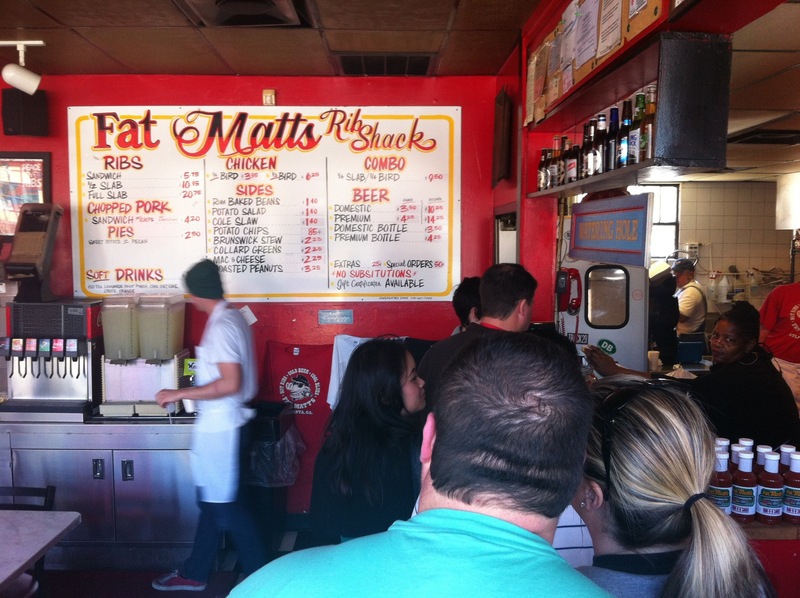 It’s easy to recommend Fat Matt’s – the food is delicious. The meal cost about $28 for both of us, including a soda and a beer. 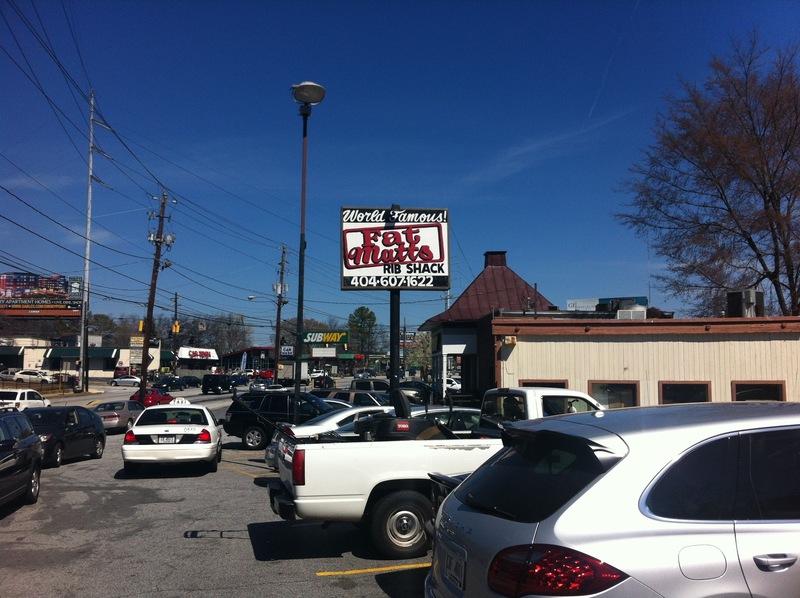 If you’re in Atlanta and want good ‘cue, go here.